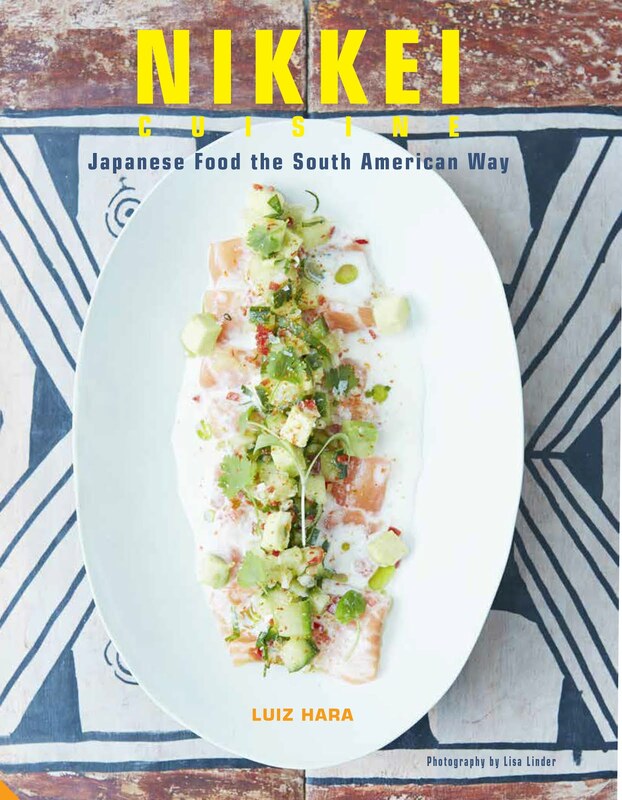 Cost: Small plates range from £4 to £8 and you would need at least three plates per person to make a meal of it. There are a few larger dishes from £14. 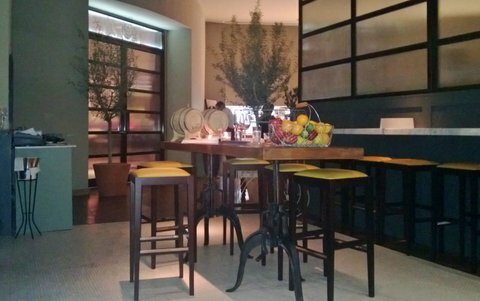 About: Tozi is the latest addition to a growing cicchetti scene in London. 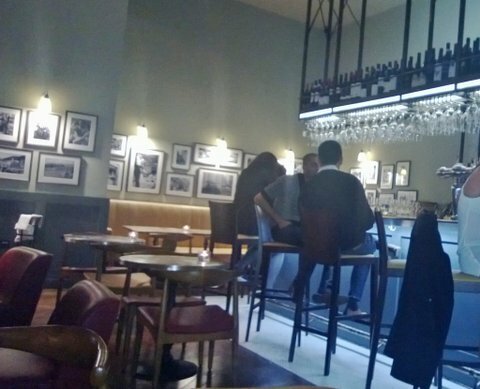 Cicchetti is the Northern Italian answer to tapas, with baked and fried delicacies and even small portions of main courses such as stews and roasts are washed down with drinks, either as aperitivo or a main meal. 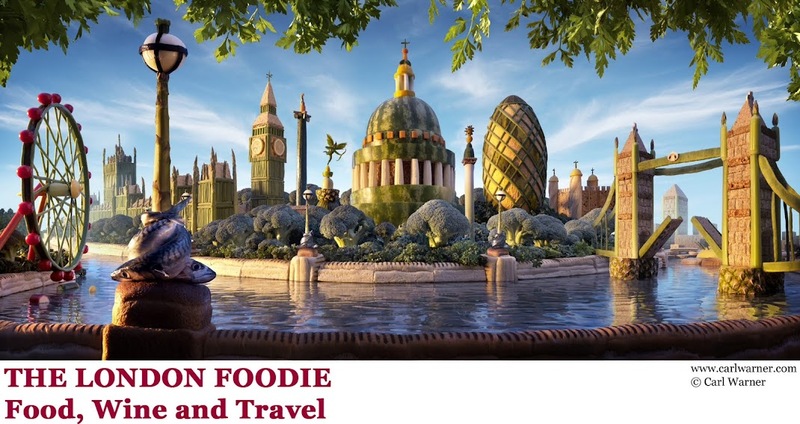 Located in the backwaters of Victoria station, it is an unlikely find, but the cooking is good enough to make the trek out, even if you aren’t killing time before catching a train. It is located in the Park Plaza hotel, although I didn’t realise this until we left – the entrance is separate and there was no clue of hotel ‘styling’ in the décor. 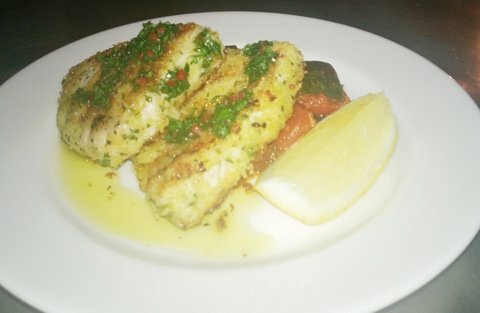 Where: 8 Gillingham Street, London, SW1V 1HJ (http://www.tozirestaurant.co.uk). What we ate: Small plate dining can be a little frustrating if you are ravenous and part of a large group, politely waiting for your turn to scoop up your 1/8 share of a raviolo. But, while this type of dining does not provide the instant gratification of having a big plate of food all to yourself, I was pleasantly replete by the time we left. Bruschetta was exactly as I make at home (a good thing as it is one of my specialities) with well marinated tomatoes, a good zing of oil and vinegar and nicely flecked with basil. 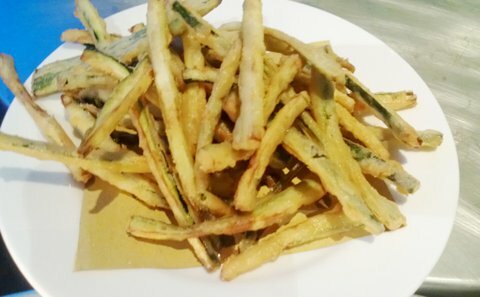 Zucchinni Fritti was perfectly fried – crisp and unctuous on the inside. And excellent value, too, at only £3.50 for a goodly mound. We also had the Calamari Fritti, which must have been good as it was polished off before I could raise my camera and click. 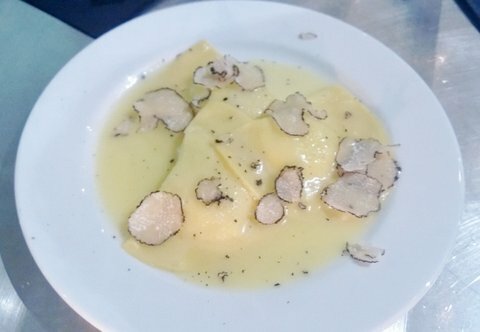 Ricotta Ravioli came with a lemony butter sauce and generously anointed with truffle shavings. I could have eaten three plates of it and happily called it dinner. 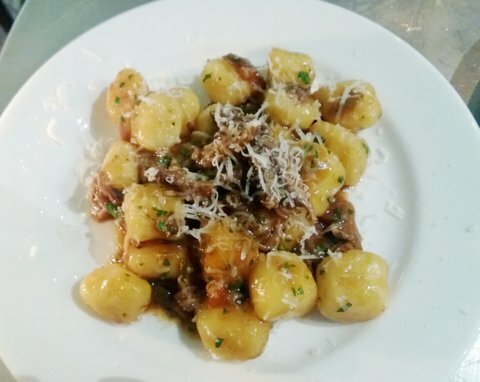 The gnocchi in the Gnocchi with Duck Ragu was soft as pillows and the ragu was interesting but had a flavour which reminded me of a Northern Italian delicacy which I have struggled to appreciate – sausages encased in salt and buried under ground to ‘season’. 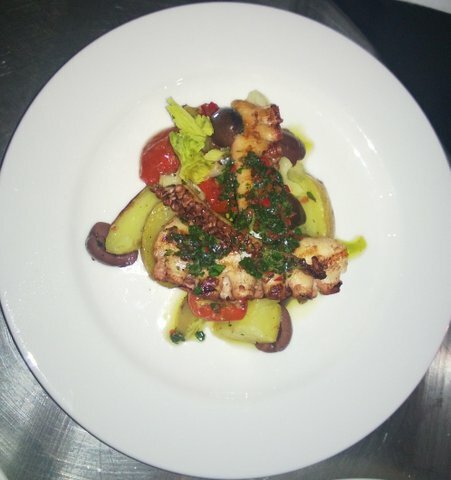 Chargrilled Octopus tentacles were perfectly cooked and came with a springy dressing with celery, new potatoes and semi-dried tomatoes. 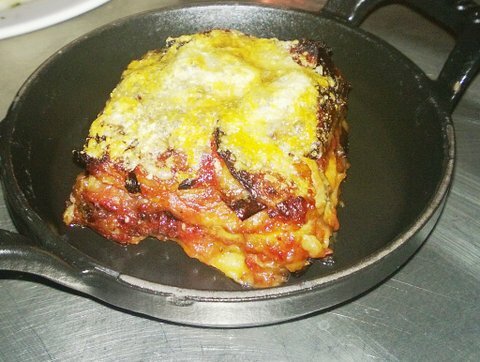 The Aubergine Parmigiana was sturdy and dense and not sloppy and oily as it so often is. 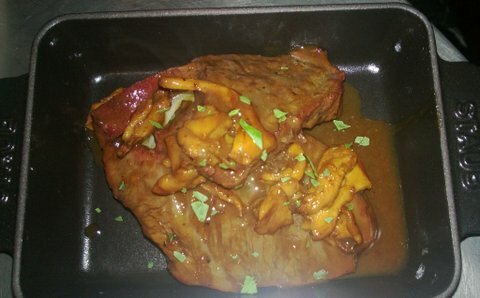 The Ox Cheeks were my favourite, cooked for as long as it takes, with the sauce reduced down to a rich concentration and the meat yielding but clinging to all the flavour of its cooking juices. The Swordfish with Caponata was also excellent, crispy coating delivering firm and fresh fish with the tang of slightly pickled vegetables. We also ate the Pizzette which was as you would expect, if a bit on the small side. And the Piadina, with an overly salty ham and not enough cheese to balance it. What we drank: The Barrel-Aged Negroni is definitely the drink to try here, as is the Prosecco on tap. My Aperol Spritz-Tozi style was a classic Aperol-Prosecco combo enhanced with watermelon juice, which I loved. 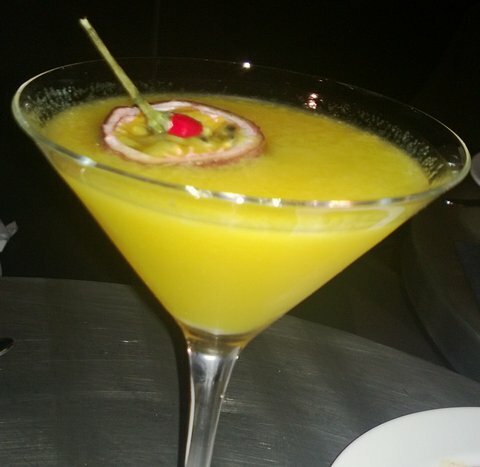 Anita Ekberg was a zesty cocktail of Vodka, chilli, ginger, cucumber and passion fruit. Likes: The food is assured and the quality ingredients shine through. The small plate concept means that a greedy person like me can try more items on the menu, which makes ordering a little easier. The cocktails are excellent and I would trek across town just for the barrel-aged Negroni. Dislikes: The plates are rather small, even for small plates. The pizzette and piadini were particularly miniscule. Verdict: Definitely worth a visit, especially if you happen to be in the area, which is largely devoid of interesting dining or drinking options. Going in a group for cocktails, with a few snacks, rather than for a full-blown meal is also a very good option. Thanks for sharing this guide. Thinking of having a vacation in London.